I’ve entered the newest design challenge through Olioboard, hosted by Layla Grayce. How fun right? I always love joining in the fun. I tend to have a different style with my boards, I don’t quite create them to give you a realistic view of the space. I like to assemble the board so that you can see how all the elements work together without distracting you from trying to place the pieces as they would be in the room. When creating a design board for clients I present them with multiple design boards along with a written tour of the space describing where each element will be placed and why. This board was fun because I really wanted to keep with a simple palette of black and white. I love the frame wallpaper by Taylor and Wood. Even if only placed on one small wall, it holds it own in style and uniqueness. Along with the black and white palette I threw in a few elements of teal. A teal scalloped rug, knotted basket and a few toys. And I love how the lines in the Sugarboo ‘Always’ print bring in a bit more of the blue. Please vote it if you can…and don’t forget you can vote daily. Click here to take you to my board. 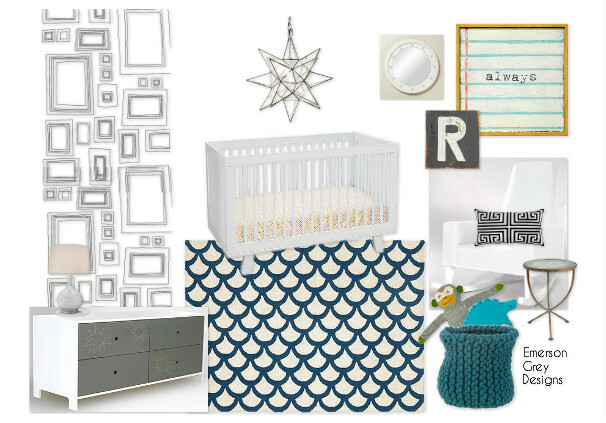 The link above will also take you to all the participating sources used on my nursery design board. I always appreciate your support…Have a great Tuesday! So cute! Love that rug!